Ah Cthulhu, one of my favourite dark gods. It’s a bit of a shame his image has been commercialized to such a degree that you can buy cute plush toys and cartoon mugs bearing his likeness. I favour the more old-school designs that paint him as a true sunderer of worlds. Cthulhu, the dark ambient album from Cryo Chamber, falls into the latter camp in every way, from the evocative artwork on the cover to the leviathan sounds on the track. Yes, Cthulhu is one mammoth track that is almost 80 minutes long. I like this as it dissuades you from skipping around. You can just set it going and leave it alone. It begins with the sound of sea and storm, wet dripping and some strange creature hissing in the darkness. To me at least, it conjured the image of an isolated stone house on top of a cliff gazing down at the undulating mass of an angry ocean. Then you go deeper. The sounds take on the distortion of being underwater, creating an almost claustrophobic feeling, yet you also have the feeling of being suspended in a great void with unknown things swimming beneath and around you. You can hear them. Think whale song but more sinister and you are half way there. It’s very relaxing, if you are of a certain frame of mind. It is after this that the first melodies begin to play. They are haunting and distant, like ancient horns blown far far away. They conjure Cyclopean underwater cities and strange flora and fauna to mind, things that have existed on the planet millennia before humans were around. As things progress, you feel that you are inside massive structures, echoing thumps and shrill cries reverberating from walls that no human has seen or touched. About half way into the track, things turn a little sci-fi. Static and crackles hint at energy manipulation, reality tearing and the great power of Cthulhu brought to bear on the veil that separates the worlds. For me at least, the rest of the album is the sound of Cthulhu unleashed, culminating in his appearance amidst the screams of onlookers. His calls and bellows are epic; the sea around his body broiling and surging away from him. It could have been his emergence near some sea-faring vessel but I liked to imagine he was approaching the shore near a large modern city. There we have it, a fantastic dark ambient album that should appeal to any Cthulhu fan. A knowledge of Cthulhu isn’t a must but you will certainly get the most from this soundscape if you at least have some awareness of H.P Lovecraft’s work. 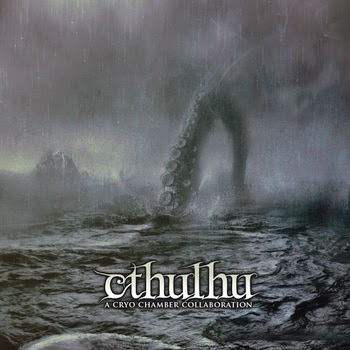 I give Cthulhu 5/5, it’s everything I want from a dark ambient track, married to a concept that I already like a great deal. Visit the Cryo Chamber page here for purchasing options. I was given a free copy to review. Artists: Alt3r3d Stat3, Alphaxone, Aseptic Void, Atrium Carceri, Cryobiosis, Halgrath, Neizvestija, Ugasanie, Mystified, Asbaar, Dark Matter, Sjellos, Sabled Sun.